If you have a can of chickpeas sitting in the pantry, you're already halfway to a tasty dish thanks to these recipes. From sandwiches to salads and everything in between—including, of course, a homemade hummus—we've got you covered at lunch, dinner, and snacktime. 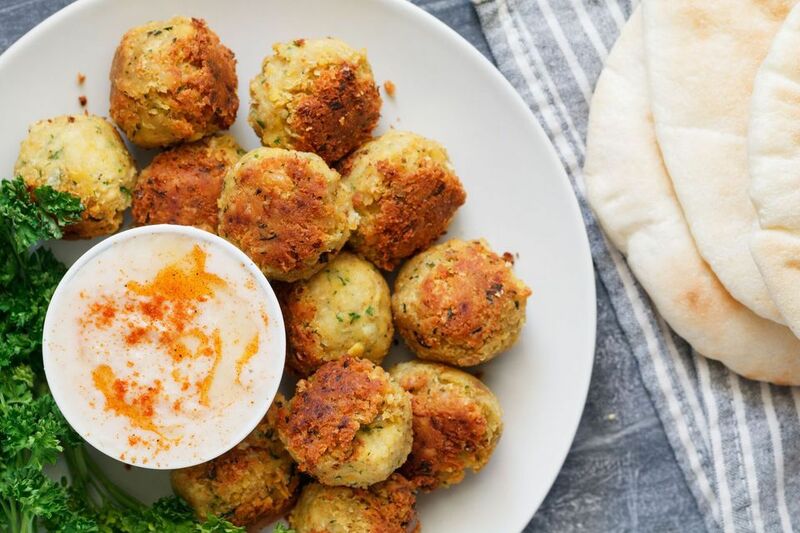 Falafel is a classic dish made with chickpeas or fava beans and spices, and it's one of the most popular Middle Eastern street foods. If yours start to fall apart, you can add more flour or an egg for binding, but do it a little at a time to avoid drying out the mixture. Serve them in a falafel pita sandwich with tahini, tomato, cucumber, red onion, and even pickles or French fries. Add chickpeas and spinach to pasta salad for a hit of extra protein and iron. Any shape of pasta will do, but smaller, rounder types soak up the sauce best. This version is lighter than the mayonnaise-laden versions you usually see at the deli counter and the nutty tahini dressing will delight your dinner guests. It's perfect for a picnic side or an easy meal. This Moroccan-style pilaf uses chickpeas, red or yellow bell pepper, zucchini, sweet potato, and a variety of spices you might already have in your collection. Don't be intimidated by the list of ingredients: it comes together quickly and doesn't suffer if you sub out one or two of the veggies or spices. It's also vegetarian and vegan-friendly! Umami roasted chickpeas make a great, high-protein, low-carb replacement for potato chips, nuts, or other snack foods. Just 15 to 20 minutes in the oven gives the legumes a crispy skin and tender center, perfect for eating by the handful or throwing on a salad, couscous dish, or as part of a roasted vegetable rice bowl. Feel free to play around with the spices, for sweeter or more savory versions. Forget American cheese and white bread. This next-level grilled cheese uses beets and chickpeas to make a falafel-like patty that gets topped with melty feta for a Middle Eastern take on everyone's favorite simple sandwich. This one takes a little more work than the traditional, but it's worth it. Trust us. You might not realize how easy it is to make your own delicious hummus at home. Just blend up a few ingredients and you're on your way to delightful dipping. Save the liquid from canned chickpeas—it makes the hummus thicker and creamier. You can add spices and additional toppings—cayenne or crushed red pepper flakes, diced Kalamata olives, and za'atar all make great additions. Those of us who love the comfort food appeal of shepherd's pie, but want to avoid meat know that can be a challenging balance to strike. This recipe uses sweet potato topping for a more flavorful, lower-carb option, with beans and mushrooms providing a vegetarian-friendly base. Serve it with a leafy green salad to balance out the richness of this main dish casserole. This simple chickpea and coconut curry brings big Indian flavors without a lot of work. Many of the ingredients probably live in your pantry already and it freezes well. Make a big batch and save some for later. It's even better the next day, so plan ahead for an optimal experience. Serve it with some warm naan or pita bread for dipping. Forget those dry hockey pucks you find in the freezer aisle and meet your new favorite veggie burger. 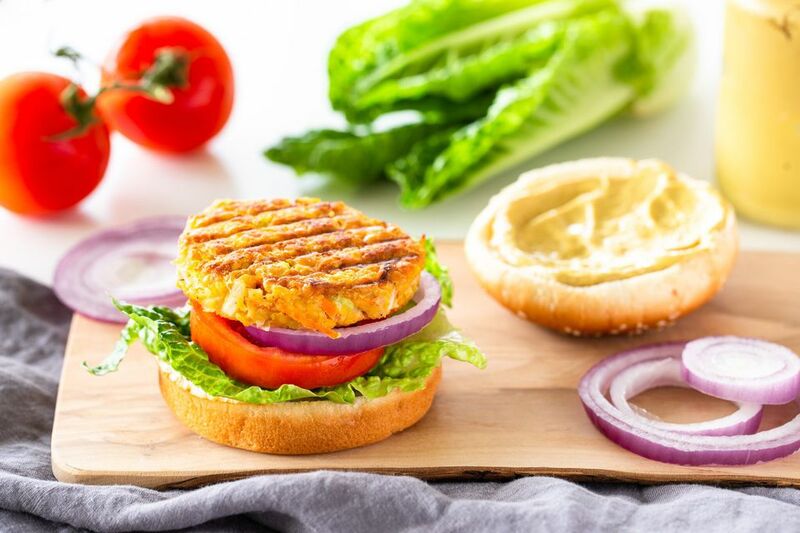 This bright, vegetable-packed patty tastes as good as it looks and it's packed with nutrients, too. Make it gluten-free by using chickpea flour and a gluten-free bun. Try out a popular Moroccan street food with kalinti, a quiche-like tart made with eggs and chickpea flour. You can find this type of flour at your local Middle Eastern or Asian market, or make your own with dried chickpeas. It tastes best hot, so serve it right away as a light meal or snack. Add harissa or cumin to taste, for extra spice or with a dollop of tzatziki on top. Many people haven't tried Brussels sprouts raw, but this simple chickpea salad will open your eyes. Shredding the little cabbages gives them a great, leafy texture and the creamy tahini and lemon dressing offsets their bitterness wonderfully. Try it as a light lunch or a delicious side dish. Need a vegetarian or vegan-friendly solution to Taco Tuesday? These chickpea and cauliflower tacos have you covered. Roasting the chickpeas gives them a toasty, crunchy texture that goes great with smoky roasted cauliflower. If you don't need the recipe to be vegan, garnish with a little cotija or other crumbly cheese and serve with homemade guacamole. This vegetarian twist on a classic chicken or tuna salad makes a great light lunch. Chickpeas have enough protein to get you over the afternoon slump and the tangy dressing punches the brown bag up a notch. Add whatever fixings you like in tuna, chicken, or egg salad to customize the flavor profile. Go gourmet at your next party with this pesto chickpea dip. This recipe calls for prepared pesto sauce, but you can easily make your own, especially if you have basil to use up from the garden. It tastes great as a dip with pita or tortilla chips or cut-up vegetables. For extra lunchtime pizzazz, use it as a sandwich spread. This gluten-free flour makes a regular appearance in Indian, Moroccan, and Pakistani cuisines and it's really easy to make. All you need is a spice grinder, food processor, and some dried chickpeas. It takes about 10 minutes and can be used for a wide range of other recipes. Store it in a cool, dry place with a tight-fitting lid, just like your other baking supplies.